This morning, on the final day of my visit to Berklee Valencia, I attended a gig/masterclass with the remarkable Dutch jazz trio Tin Men And The Telephone. ‘Jazz Trio’ is really an inadequate term for this ensemble. It might better be described as ‘interactive iPhone jazz gaming with live humans’. The setup is as follows: the trio is piano, upright bass and drums. The drummer has a MIDI drum pad and snare sensor. The bassist has an effects pedal. The piano has a MIDI converter attachment, feeding a MAX patch, with occasional effects processing of the piano signal. Tin Men and the Telephone: Tony (piano), Pat (bass) and Bobby (drums). All of the musical information on the backdrop – drum loop (left), melodic fragment (top) and chords (bottom) is generated in real time by audience members using an app. Did I mention they’re amazing improvisers? Abstract: Look Ahead is a jazz piano and bass, duo recording of performance-music, tracked, mixed and mastered at 24 bit/96khz for stereo and 5.1 playback. Esoteric microphones and pre-amps contributed tonal diversity and contrary to standard practice, the stereo mix was folded-out to 5.1, rather than folded-down to stereo. It was pre-determined that a “sympathetic openness” in the playing and sound was a desirable aesthetic, thus the “performance oriented” physical setup was a blending of the traditional Oscar Peterson and modern Keith Jarrett piano/bass set ups. These choices set forth a coherent foundation toward an intimate, immersive and dynamic performance recording. The stereo sound-field begins at the phantom center position of bass and the 5,1 mix builds outward, maintaining a natural coherence between both versions. The upright bass was recorded with a carefully centered stereo ribbon microphone, a mono hyper-cardioid condenser and a “DI”— the piano utilized two outside mics (U87’s), providing a cohesive center image that is blended into an inside-placed “ultra-wide-stereo” Calrec-Soundfield mic, limited to approximately 90% of pan-width, reserving the outer L/R edges for reflections and reverb. Multiple reverbs were mixed and panned to avoid a dead-spot between the R-RS and the L-LS. Since there are no drums this “chamber” became a featured participant of the ensemble, providing unexpected and contrasting responses to percussive attacks. The conclusion asserts that a stereo sound stage built on traditional performance and recording values provide a connecting foundational coherence when folding-out. A stereo to 5.1 fold-out, rather than a “5.1 fold-down”, offers additional immersive enhancement—specific to 5.1—resulting in diverse custom masters that share strong foundational innate commonality. OUTLINE: In his article ‘Is jazz popular music?”, Simon Frith (2007: 10) has noticed that the “separation of jazz and popular music studies is an indisputable fact of academic life”. Indeed, due to their historically different developments, both disciplines have established sets of aesthetic norms, separate institutional bases, and specific methods to identify and cope with the musics they have found worth studying. Recently, Matt Brennan (2017) has shown the influence of music journalism on these scholarships. Ultimately, both succeeded – more (jazz studies) or less (popular music studies), at least in the German-speaking world – as distinctive disciplines with developed curricula. This keynote argues, by pointing to examples throughout the history of recorded music, that this neat division of the musical world is precarious because it prevents a fertile exchange between jazz and popular music studies; for instance, the development of (still) so-called New Jazz Studies during the last twenty years has only occasionally led to serious discussion in the popular music field. Moreover, this separation excludes a lot of musics, musicking and musicians in between these two fields. In particular, by using an example from the realm of electronic dance music, the lecture advocates a joint effort to fill the void in between the front lines of jazz and popular music that, potentially, may lead to structural changes in teaching and researching jazz and popular music. Brennan, Matt (2017). When Genres Collide. Down Beat, Rolling Stone, and the Struggle between Jazz and Rock. London et al. : Bloomsbury. Frith, Simon (2007). “Is jazz popular music?” In: Jazz Research Journal 1, DOI: 10.1558/jazz.v1i1.7. BIO: André Doehring is professor for jazz and popular music research and head of the Institute for Jazz Research at the University of Music and Performing Arts in Graz (Austria). Before, he has been assistant professor at the University of Gießen (Germany) where he received his doctorate in musicology and had studied musicology and sociology. He is president of the International Society for Jazz Studies (IGJ), member of the scientific board of the German Society for Popular Music Studies (GfPM), co-editor of GfPM’s online journal Samples and since 2017 of IGJ’s yearbook Jazz Research and Studies in Jazz Research. His main research topics are the social histories and historiographies of popular music and jazz, analysis, and music and media. Currently, he is involved into establishing a European network for transnational jazz studies. PUBLICATIONS: Song Interpretations in 21st Century Pop Music (Eds. Appen/Doehring/Helms/Moore, Ashgate, 2015); “Andrés’s ‘New For U’ – new for us. On analysing electronic dance music” (Ashgate 2015); “Modern Talking, musicology and I: analysing the forbidden fruit” (Routledge 2016); “Male journalists as ‘artists’: the ideological production of recent popular music journalism” (Éditions des Archives Contemporaines 2017). André laments the relative historical disinclination of academe to be prepared to engage musicologically with pop and jazz. He states that there is still a percentage bias against non-classical musics, citing as evidence the tiny proportion of popular (as opposed to classic) musicology professorships in German universities. He leads us through the history of some pioneers, including Marshall Stearns, who founded the Institute for Jazz Studies in 1953 New Jersey, USA. We are led through the gradual growth of jazz studies in (mainly US) Higher Education from the 1950s onward. Keynote: Bruce Johnson (Macquarie University, Australia): No Cogitation without Representation: gesture and cognition in early jazz. One of the problems in exploring early popular musics is the dearth of direct documentation of largely unscored musical performances. The earliest documents of jazz for example were refracted through press reviews, low fidelity recordings, staged photographs and silent films, and in its crucial diasporic forms even this evidence was sparse to non-existent. This paper explores ways of engaging with early popular musics through its surviving, and often silent, representations. In doing so it ‘challenges orthodoxies’ about the relationship between musical cognition, its performance representations and its larger cultural contexts. 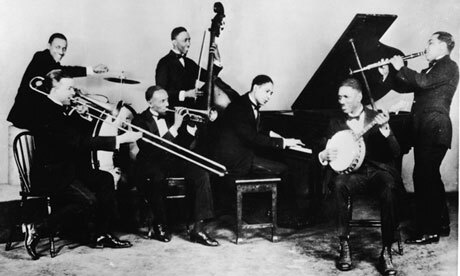 It will review still and cinematic representations of jazz through the 1920s and into the 1930s, with particular attention to the Australian situation, and suggest that performance gesture might well be more of a key to understanding the larger ‘cognitive ecology’ of popular music than the idea of ‘representations’ usually implies. The paper suggests that all those corny 1920s images of jazz bands may be read not as ￼representations of a form of music, but as integrated components of musical cognition, and as such provide a template for the analysis of the performance mannerisms of all popular music. With apologies to Bruce for missing the start (an incident with a bus driver), I will not try to summarise the paper itself, but from what I could glean from the excellent second half and from the questioning, the abstract summarises his approach effectively. If he publishes this work I’ll update this post with a link to the document.